Clitheroe lost at home in the league for the first time since August, thanks to a second half winner from Mossley striker Andy Keogh. Simon Garner made one enforced change, with skipper David Lynch serving a one-match suspension - Ross Dent coming in as his replacement. It was Dent who had the Blues’ only chance in the early stages, when his shot from 25 yards went over the bar. Mossley had their the best chance of the first half on 23 minutes, when Blues keeper Andrew Dawber was forced to make a fine save from Luke McGonagle’s curling free kick. The ball rebounded to Sam Robinson, and Dawber again had to make a smart save. The Blues had a very strong claim for a penalty on 30 mins, when Richard Burns was pushed over in the box, but the referee waved play on. The Blues looked more likely to open the scoring towards the later stages of the first half. Jason Hart had a good effort on the turn on 32 minutes, and a couple of minutes later, good build up between Danny Morton and Danny Wilkins saw the latter’s low cross cleared away by a Mossley defender, as the sides went in goal-less. The only goal of the game came on 50 minutes, when Keogh was left unmarked to head home. Mossley almost scored a second goal on 71 minutes when Fish broke clear and slid the ball past Dawber, only for Roberto Bonaminio to clear the ball off the line. 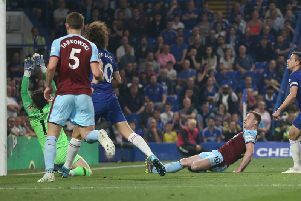 The Blues’ best effort in a disappointing second half came from substitute Alex Ralph, who hit an excellent dipping shot from 25 yards which went inches over the top. Mossley’s strong defence held out for the remainder of the game to claim the points. It was a disappointing afternoon for the Blues, who now have a break until their next game at Bamber Bridge in the Lancashire Challenge Trophy on Tuesday night - with Saturday’s league clash with Warrington Town postponed due to Town’s continued involvement in the FA Cup. Clitheroe: Andrew Dawber, Danny Morton, James Walker, Roberto Bonaminio, Laquan Esdaille, Simon Garner, Danny Wilkins, Ross Dent (Seydou Bamba 82), Sefton Gonzales, Jason Hart (Carl Mercer 61), Richard Burns (Alex Ralph 61). Subs not used, Ryan Cattermole, Alex Palffy.